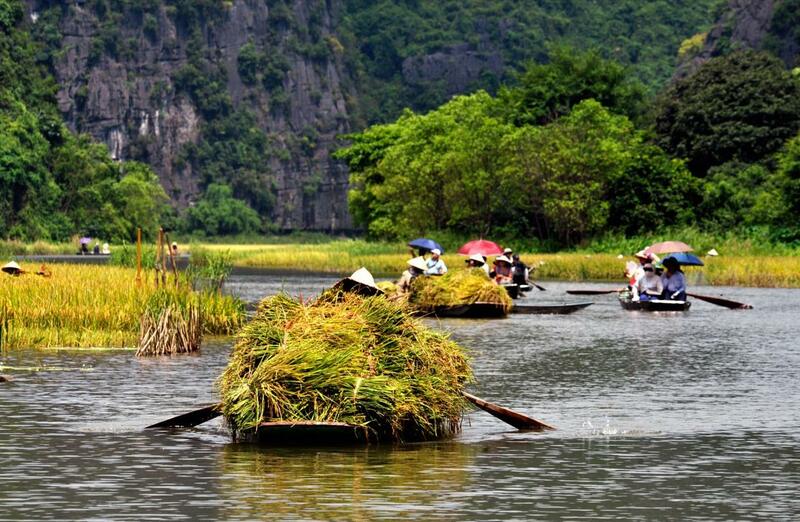 Favored by the Mother Nature with karst topography fostered through million years, the topography of Ninh Binh makes it a Halong Bay in land with uncountable primitive valleys, caves and submerged mountains which all offer exceptional sceneries. 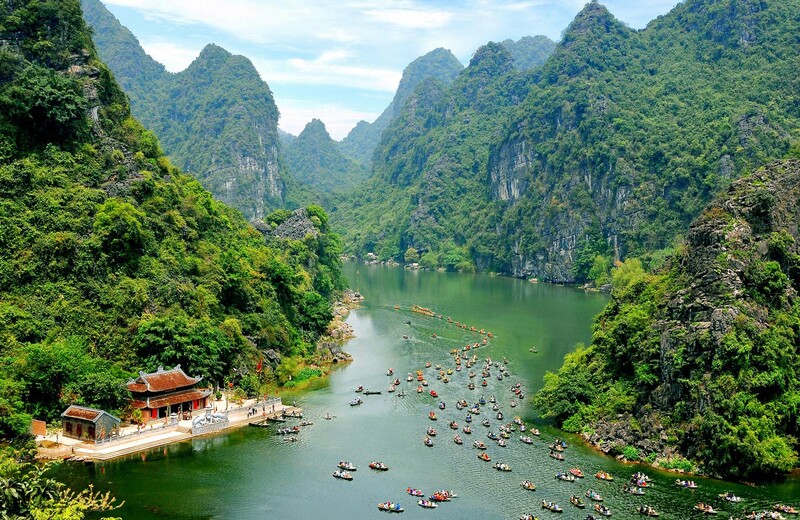 Moreover, thanks to its wide variety of rivers, mountains, forests and sea; national park and nature conservation area, one may see a microcosm of Vietnam within Ninh Binh. Expanded in recent years and soon become famous for a system of caves, valleys and historical relics, Trang An eco-tourism center is the most famous attraction. With a chain of natural wonders like Bich Dong Pagoda, Thai Vi Temple, Tam Coc, Sunny Valley or Fairy cave; Tam Coc – Bich Dong tourist center is considered as Nam thien de nhi dong (The South’s second best cave). 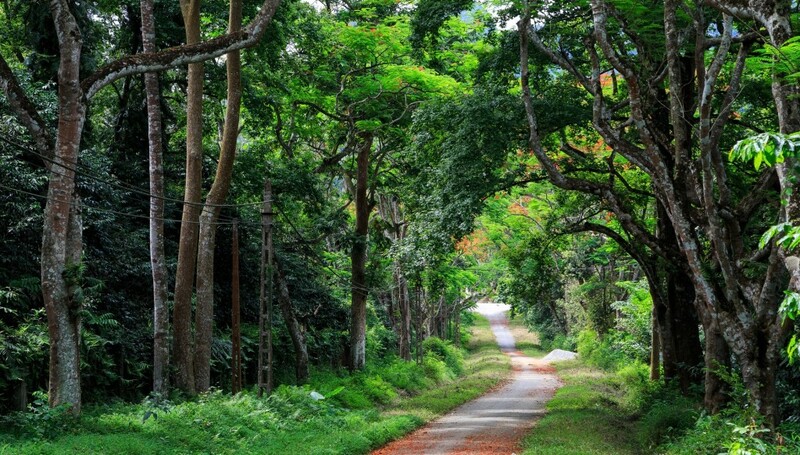 For animal and environment lovers, Cuc Phuong National Park, which is the first national park of Vietnam preserving a variety of rare animals and plants covering a total area of up to 22,000 ha, is a should-not-missed site. 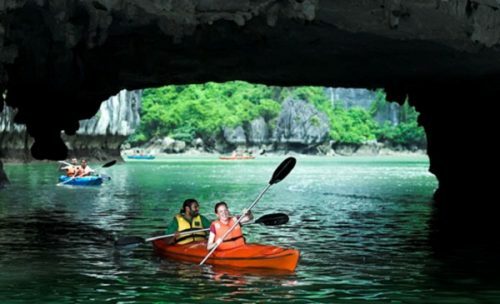 Submerged Van Long nature reserve, which is the largest conservation area of this kind in the North of Vietnam, with Kem Trong cave, Van Trinh cave and Kenh Ga hot spring, is another destination travelers may be interested in. Thanks to the development as the political and cultural Vietnam’s center since the reign of Dinh Tien Hoang King in 968, Ninh Binh has the number of ancient vestiges overwhelming any other provinces in Vietnam. The first capital of Vietnam feudal centralism regime and the Dai Co Viet’s economic, political and cultural center Hoa Lu Ancient Capital is definitely the most favorite site where travelers can find thousands of vestiges of pagodas, temples, palaces and tombs related to the three dynasties of Ly, Le and Dinh. The Vietnam’s Buddhist Center and also the largest pagoda in the South East Asia, Bai Dinh Pagoda, which has recently been listed as top attraction in Vietnam and the region, allures travelers by a complex of both ancient and new pagodas. Phat Diem Church – the Vietnam’s most beautiful church which was built of stone and wood in all 24 year, is one more remarkable attraction of Ninh Binh. 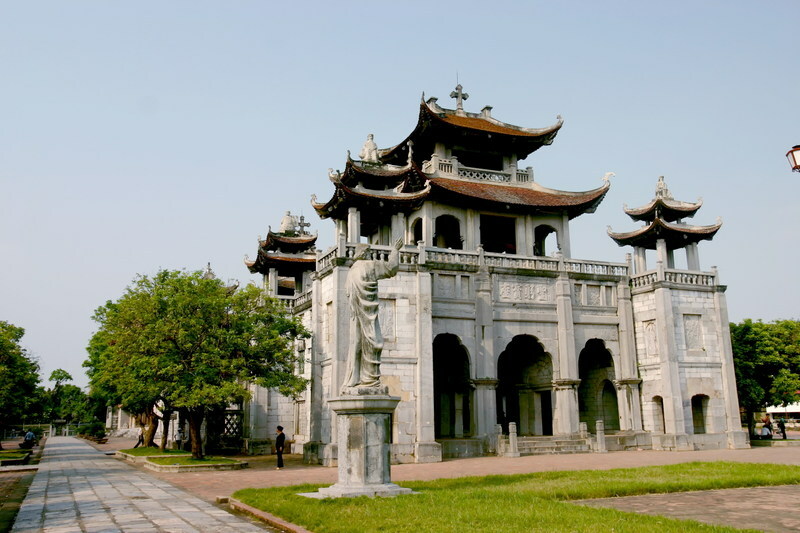 Besides its size, Phat Diem Church also allures tourists by its unique characteristic as a center of a religion originated from Western country built in Vietnamese architecture. When thinking about Ninh Binh, you might immediately think about Kim Son wine, delicious dishes made from goat, eel vermicelli and Com Chay (dried rice). When travelling to Ninh Binh, Ninh Binh Burned Rice and Ninh Binh Goat Meat are the two types of food that you should not ignore. Because of not only the recipe but also the sauce, Ninh Binh Burned Rice is more different and special than that made in other places. 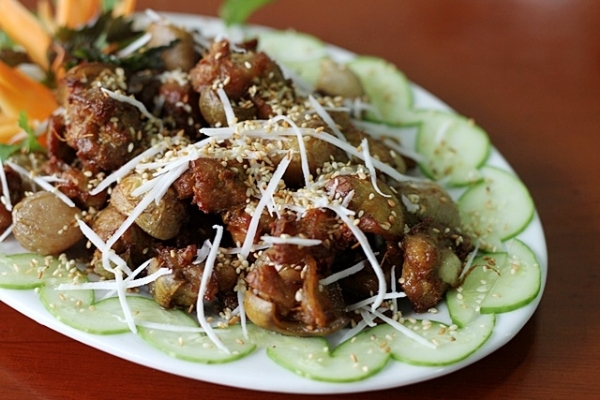 If you have never eaten this dish, such a popular dish in Ninh Binh City, along the streets and the tourist areas, this is a great occasion for you to enjoy and feel the differences. Hoa Lu people often cook the goat meat into many diverse dishes such as grilled goat meat, steamed goat meat, goat meat roll, freshly drawn blood (tiet canh), etc. Not that all cooks can cook the awesome goat meat, so not only due to the spices and the recipe, the special flavor of this food also depends on the clever hands of the local cooks. Not only tasty, Goat Meat is also good for health, especially for the pregnant women. 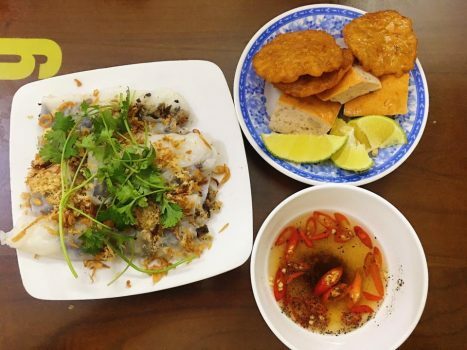 Besides these types of food, there are also a lot of other mouthwatering dishes that create the unique cuisine of Ninh Binh such as Eel Noodle, sour soup with anabas, Yen Mac Meat Roll, etc.